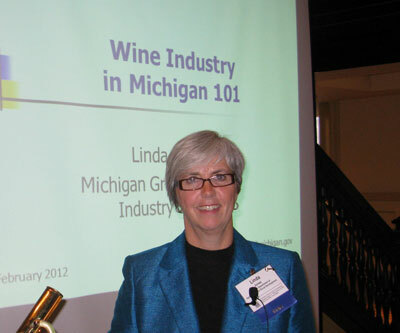 What’s surprising about Michigan Sauvignon Blanc? That so few Michigan wineries produce wines from this fascinating versatile and aromatic varietal is really quite surprising. The Wolverine State makes much more white wine than red wine but very little Sauvignon Blanc. Why? 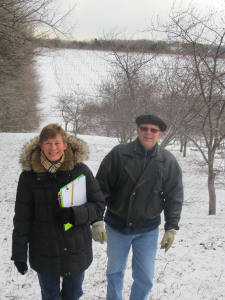 Susan and Bill Braymer make estate grown Sauvignon Blanc at Laurentide Winery in the Leelanau Peninsula. This ancient varietal is one of, if not the, most expressive grapes on earth. It’s aroma’s and flavors range from soft and subtle to assertive, in-your-face wines. As the Midwest wine industry expands, producers are seeking varietals to add to their portfolios. As Oz Clarke, noted author of Grapes and Wines puts it: ‘Sauvignon Blanc is the most useful grape variety in the world…I need a wine that is totally reliable, that will always give me a painter’s pallet of flavors anyone can understand as soon as they smell and taste the wine. Sauvignon Blanc. That’s my baby”. ‘Crisp, elegant, herbaceous, fruity, and fresh” are ways to describe Sauvignon Blanc. It has such a distinctive character, with naturally high acidity, it is usually ‘tangy, tart, nervy, racy, or zesty”. This acidity also can keep even sweeter versions from being too sickly sweet. This varietal derives its name from the French term “sauvage”, meaning wild, not because it’s any wilder than other grapes, but because its leaves are very similar to those of wild grapes. Blanc means white in French, so, a literal translation is “wild white”! Styles range from the elegant, minerally, flinty, limestone terroir-driven version from the source of Sauvignon Blanc, the Loire Valley in France. to softer, grassier, fruiter wines from California and Chile. New Zealand reditions are usually pungent, in-your-face wines that have put the Kiwis at the cutting edge of Sauvignon Blanc production. They are also responsible for promoting the use of the screw cap. Stainless steel fermentation tanks are usually the preferred method in producing Sauvignon Blanc. Barrel fermentation is not commonly used for this variety but where it is, (see below) it tends to round out the flavors and softens the naturally high acidity modifying the aromas and adding complexities. Sauvignon Blanc is usually consumed young, as it seldom benefits from aging. It is the classic ‘quick turn white” that is often most desirable in the spring and summer months that immediate follow the previous year’s harvest. An exception to this “rule” is that sweet white dessert wine, Sauternes. It utilizes Sauvignon Blanc as a major component and is one of the few exceptions that can be very age worthy. This white grape ripens early, making it an excellent candidate for growing in Michigan. Let’s explore some of the renditions from the Mitten State. Up in Northern Michigan, two wineries are crafting varietal wines from this ancient French grape. Laurentide Winery is located in lovely Lake Leelanu on the peninsula of the same name. A former cherry farm, as so many vineyards are, almost 900 feet above sea level, this recent addition to the Michigan wine scene produces delicate Sauvignon Blanc. Susan and Bill Braymer are proprietors of this picturesque property. These partners in life and wine met at the University of Michigan, lived in California for years, traveled widely in French wine country and returned to the Wolverine state to stay in 2006. Naming their winery after the glacial ice sheet that formed Michigan, with one of the area’s best know winemakers at the helm, they have bottled a couple of vintages of “Sauv Blancs”. WaterFire is a pioneer in Michigan wine-making. Family owned by Chantal Lefebvre and Mike Newman, they, along with son Nate, planted their first vines in 2009. 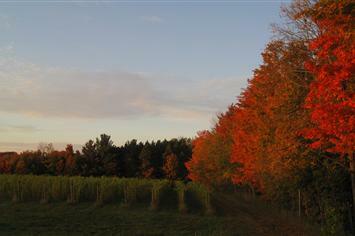 Their vineyards are perched above Torch Lake, in Antrim county. Their estate grown wine is 100% Sauvignon Blanc. Their vines are planted in East/West rows so “the South side of the vines get the most heat possible, while the North side are cooled by the breezes. The southern grapes provide us the tropical characteristics while the northern ones supply the acidity and mouth feel we’re seeking”, according to winemaker Bryan Ulbrich. Heading south, three producers are making distinct styles of this versatile wine. Fenn Valley, owned and operated by the Welsch family, was established way back in 1973. Their version of Michigan’s underappreciated grape is 100% Sauvignon Blanc from the Lake Michigan Shore AVA. Their style is reminiscent of New Zealand. Down the road apiece is Karma Vista Vineyards. A fun and funky winery, they have opted for the unusual style of using French oak and malolactic fermentation for their Sauvignon Blanc. This wine is creamy and round when compared with other Michigan versions. Domaine Berrien is Wally and Katie Maurer’s’ pride and joy. Founded in 2001, they focus on Rhone varietals yet make a clean, crisp and refreshing Sauvignon Banc in the New Zealand style. No oak, all stainless steel. Zingy! Whether made in the Old World or New World style, these Michigan Sauvignon Blancs can amplify the flavors of food. Served as an aperitif, the wine perks up the taste buds of guests, making them hungry. Appetizers such as artichoke dip, shrimp and salads all pair well with this light-bodied varietal. Flavors of bell peppers, grapefruit, and smoke compliment lean poultry, sushi and many vegetables. It’s certainly more food-friendly than most Chardonnays! Just in case the winters are giving your SB plantings trouble: Cabernet Dore’ (white) is a winter hardy cross of Cabernet Sauvignon and Norton. Cabernet Dore’ has Sauvignon Blanc as one of its grandparents. The grapes and wine make a very French (not California) SB similar to a white Ch. Haut Brion. Totally vinifera. The vines experienced minus 17 in Missouri with no loss of buds or any other damage. Go to Davisvines.com for more info.